Earlier this year, Duke and I accidentally ate at one of the Restaurant Week locations right smack dab in the middle of the event. Thankfully, we had reservations and were able to enjoy a great meal at Suzy Wong's House of Yum. When I heard Restaurant Week was back (Nashville Originals does it twice a year), and Duke only had one night off, I decided we should have a weeknight date at Mere Bulles. It was our first time dining at the restaurant, which despite its French name serves gourmet comfort food. I love that it is in an old historic plantation-style home, smack dab in the middle of Brentwood and surrounded by office parks. It stands out and has a beautiful ambiance. Duke said the building reminded him on Charleston. 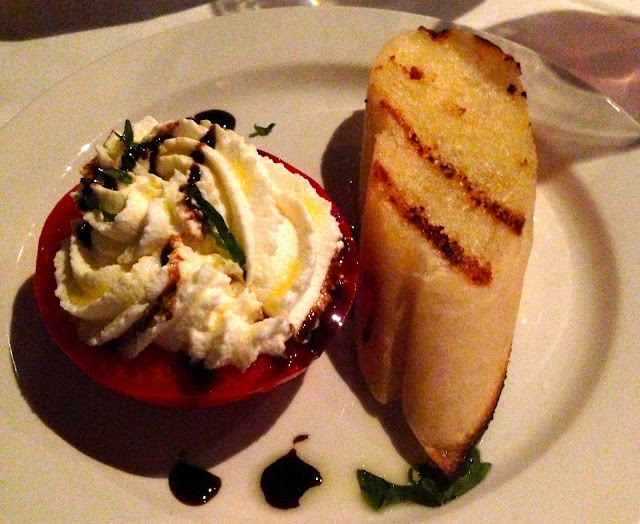 We both decided to start with the Tomato Caprese salad, which I expected to be the typical sliced mozzarella and tomatoes. Wrong. This was a decadent half tomato with piped mozzarella, balsamic, and olive oil on top. The toast point was a large, warm, garlicky piece of bread, which went perfectly with the salad. I don't eat many veggies, and I ate half of the HUGE tomato. Delicious. (And yes, I know they are really a fruit but indulge me.) We also had warm bread and butter served at the table. For the main course, we both matched again, choosing the Porcini crusted 10 oz. 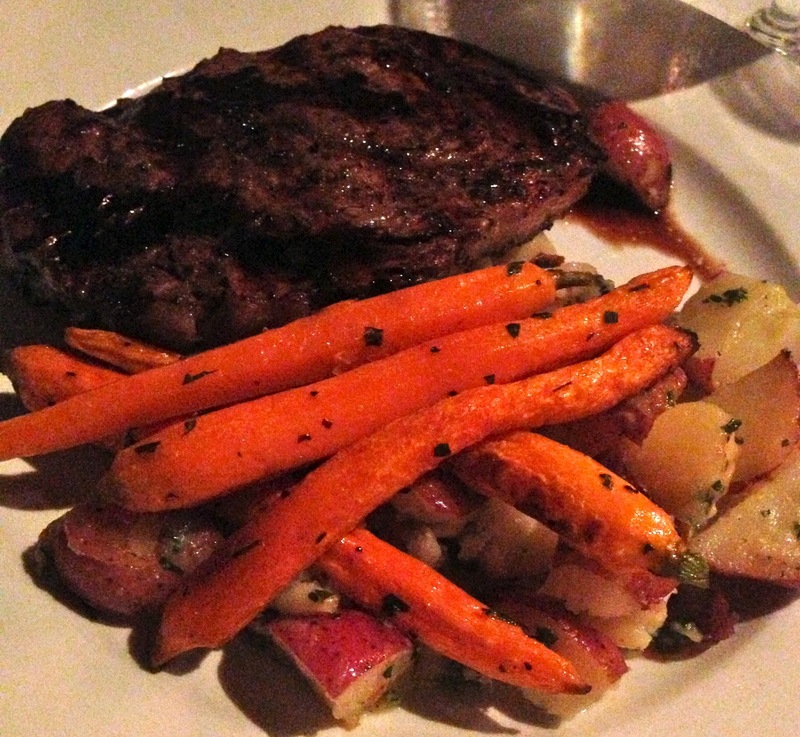 Ribeye steak, balsamic reduction, herb roasted baby carrots, and parmesan new potatoes. This steak was one of the best I've had in a long time. I devoured it. So tender, and so much flavor! Duke ate his entire steak too. The cabernet we had matched perfectly, very smooth and complementary. For dessert, there were two options... so we each chose one to share. Duke had the Petite crème brulee with mixed berries, which also had whipped cream. 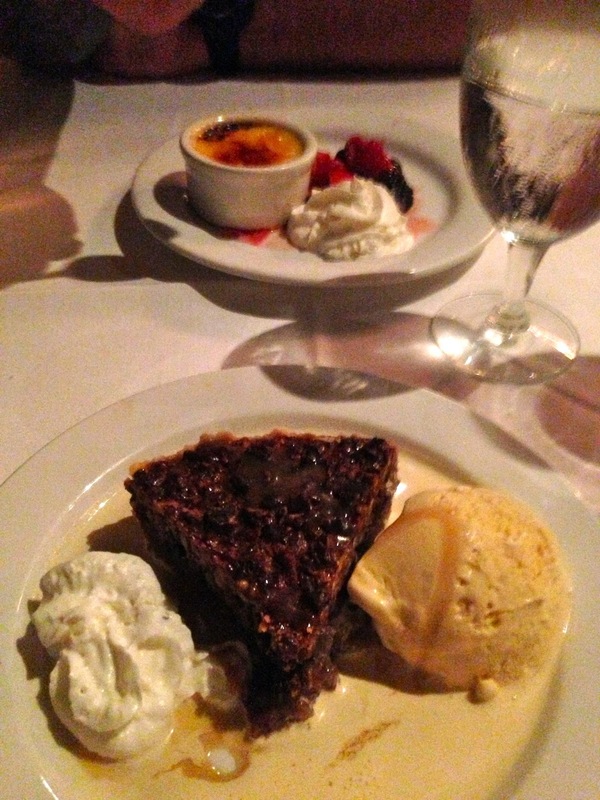 I had the Chocolate pecan pie, salty caramel Bravo Gelato & caramel rum‐sauce. Everything was delicious, but I think my favorite part of dessert was the salty caramel gelato. We didn't leave any behind! The service was fantastic as well. And the ambiance really reminded me of dining at Savannah's historic restaurants, like the Olde Pink House. What I like about Restaurant Week is the ability to try some of a city's unique restaurants with a reasonable prix-fixe, multi-course menu. (I definitely took advantage in Savannah, too!) I love to indulge in dining out, but sometimes the price point is too steep. Restaurant Week allows the chance to sample someplace you might not have tried otherwise. I loved Mere Bulles, and the great meal we had there definitely makes me want to come back! Duke couldn't believe our bill when it arrived, because it was easily half of what we might have paid if we ordered all of those courses a la carte. And the benefit for the restaurant? Once you've got them hooked, they'll be back. Oh my gosh. That food looks amazing. I'm adding that to my list of places to visit! Ooh, the desserts look yum! Creme brulee and pecan pie are like my two favorite desserts ever! I wasn't a huge pecan pie fan until I moved to the South... now I'm a convert!